After an easy flight from Male, we grabbed our bags from baggage claim and made a left to find the Crowne Plaza. The hotel is attached to the terminal (terminal 3) and was super easy to find. There was a bit of a line to check-in but once we were helped, we were checked-in by a friendly associate in a matter of minutes. We made or way to up to the room which took a bit of brain power to find. The hotel isn't fully enclosed so you're actually walking outside in the Singapore heat/humidity each tie you leave your room. Not sure who thought that would be a good idea. Once in the room, we were pleasantly surprised. For a quick (12 hours) overnight, this hotel was perfect. 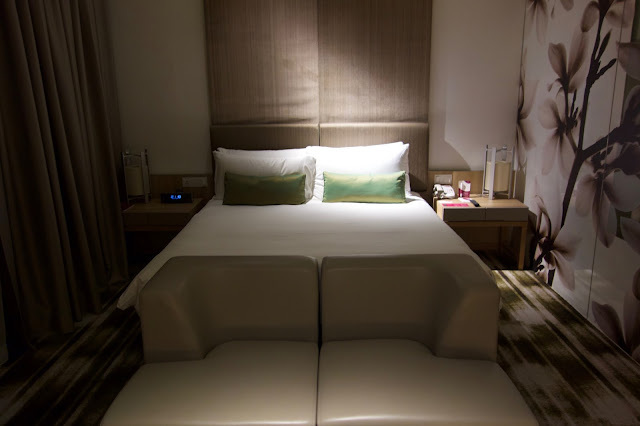 The room featured a comfortable bed, good size bathroom, and desk. I hate paying for hotel rooms in Las Vegas since there are so many major chain partnerships. That said, using Starwood/Hyatt/Hilton points for any hotel in Vegas usually amounts to a bad deal. 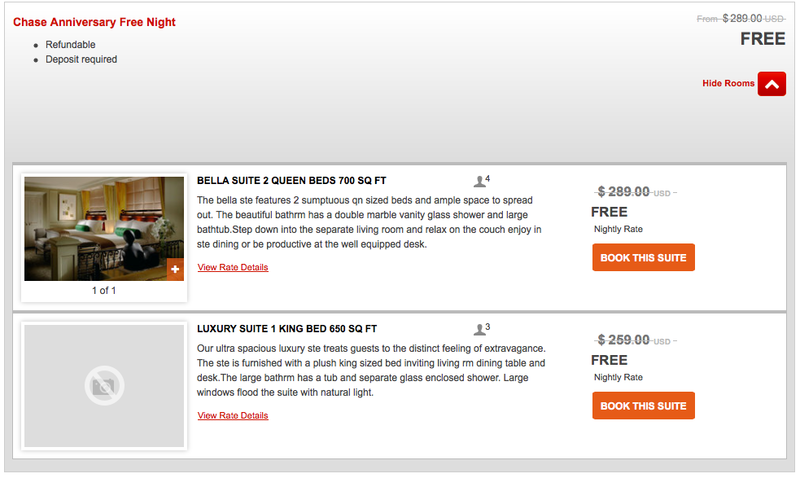 The one exception seems to be the IHG partnership with the Venetian/Palazzo. I'm headed to Vegas next weekend with my brother and while we could have paid for a number of different hotels (Bellagio, Wynn, and Encore were all <$225 per night) why would we when we could stay for free? With tax, that would amount to $500 in cash for a couple of nights. We both have better things to do in Vegas with $500. 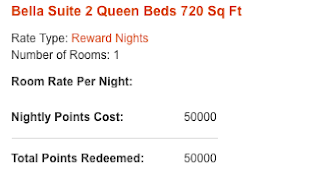 As I've done in the past, I redeemed a free night from the IHG credit card ($49 annual fee) and redeemed 50,000 points for the second night (unfortunately it's now 60,000 a night) at the Palazzo. A quick call to IHG to link the reservations (both made online) and we were all set. I quite like staying at the Venetian/Palazzo complex. It is huge (can be good or bad) with tons of restaurant options. It's close to Encore/Wynn and easy to walk over to Bellagio or Mirage for a change of scenery. Plus all the rooms are 700+ SF suites. It's hard to beat that especially when the cash rate for the hotel is $0. Emily has to be in San Francisco for work in a couple of weeks. She was scheduled to come home on a Friday so we figured we'd make a weekend out of it. For some reason (there are a couple of big conferences in town) hotels are either sold out or outrageous. The St. Regis was pricing at almost $800, the W at $600+. The Le Meridien was sold out. So were both Hyatt properties. 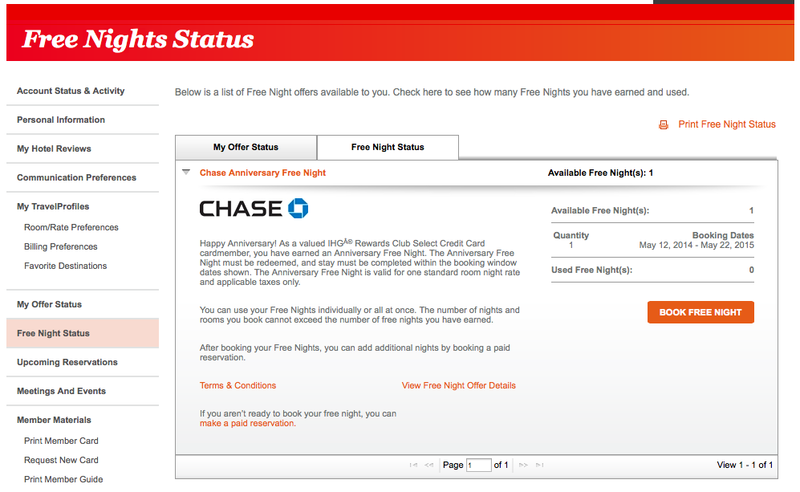 Cash and points availability and points availability at the SPG properties were both zeroed out. So I started looking at other options. The last few trips, we've either stayed at the W or St. Regis. The InterContinental San Francisco is just a few blocks away in the SoMa area. Paid rates were also going for $800+ AI but there was award availability! Both Emily and I were sitting on balances of 100,000 IHG points so this was a no-brainer and I booked it. That's nearly 1.93 cents per point. 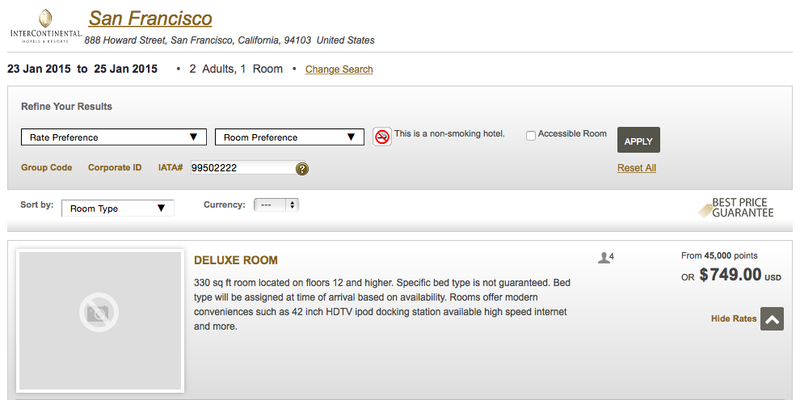 Pretty much unheard of for IHG points. This is a perfect example of how this hobby can pay off big time. 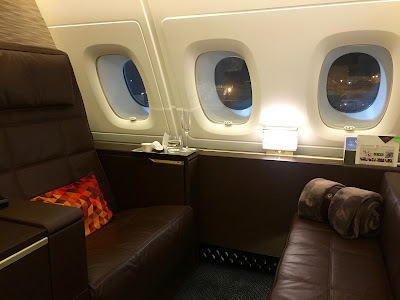 Diversify your point balances and you'll have options when you need them - whether that be a last minute flight or a tough (meaning really expensive) hotel market like San Francisco. Last month we went to Las Vegas for the weekend. We stayed at the Venetian and our hotel was free thanks to the Chase IHG credit card. 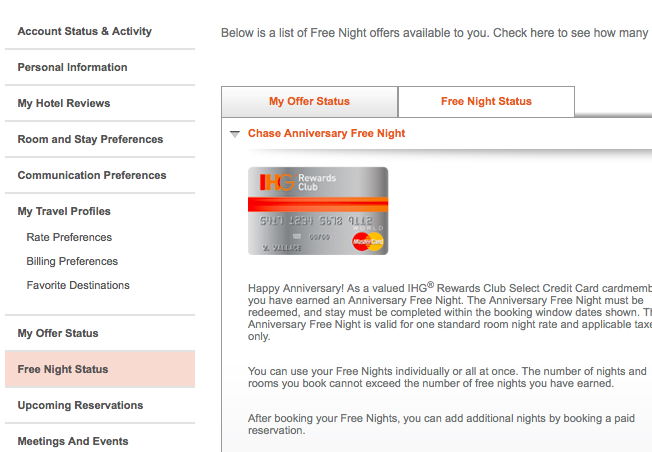 For the first night, I used the annual free night that I get for keeping the IHG credit card. Clearly worth the annual fee of $49. 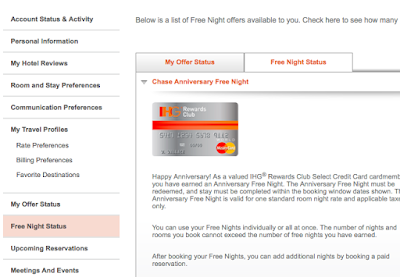 For the second night, I used 50,000 IHG points that I had earned by signing up for the card and various other promotions. I didn't think of it at the time but IHG provides a 10% rebate (up to 100,000 points per year) on award stays if you hold the IHG credit card. I checked my AwardWallet account this week and saw the 5,000 point bump in my balance. I wasn't sure where it came from so I logged into my IHG account to check it out. I value IHG points at around .7 cents each so on the redemption, it's like getting $35 back. I will definitely be keeping this card and plan to leverage the free night coupled with an award night for a weekend getaway. Well worth $49!